It’s showing its age, but the Buick Cascada is competitive enough to be worth considering. The Buick Cascada may be a fairly new offering in the premium brand’s line-up, but this four-seater convertible’s actually a slowly ageing car. For instance, the Cascada’s been sold in Europe in Opel and Vauxhall guises since 2013, and the architecture underpinning it dating back to the even older first-generation Chevrolet Cruze that debuted in 2008. As a result, this swish cabriolet isn’t quite as well-rounded as some of its more up-to-date competitors – and especially not in comparison with similarly-priced premium rivals like the Audi A3 Cabriolet and BMW 2 Series Convertible. That’s not to say the Buick Cascada is hopelessly outclassed, though. In quite a few ways, this Buick drop-top actually does a pretty good job at being a high-end cabriolet. But it’s worth pointing out to those who are interested in a car like this that, if it’s the greatest example of a practical convertible you’re after, there are objectively better options available. The Buick Cascada isn’t actually a new car, and the most obvious aspect of the car that demonstrates this is the interior. As we said earlier, the Buick Cascada isn’t actually a new car, and the most obvious aspect of the car that demonstrates this is the interior. The touchscreen infotainment system isn’t as crisp or as responsive as comparable items in newer rivals, the main control layout on the center console is crammed with buttons that aren’t that easy to operate on the move, and there are a few too many scratchy plastics for us to overlook in a car that costs $34,000. The rest of the Buick Cascada, though, is executed in a far more acceptable manner. Outside of those aforementioned low quality plastics, the rest of the materials used are of a much higher grade, and the interior itself does have an upmarket feel (perhaps best exemplified by the use of leather on the dashboard and the seat upholstery), and we’re generally satisfied with the overall fit-and-finish of the Buick Cascada’s cabin. It’s also worth pointing out that the rear seats fold down completely flat. 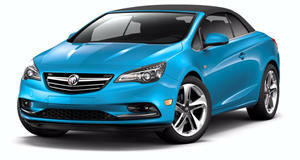 Practicality’s also fairly good on the Buick Cascada, if perhaps a bit limited in some places. Though the trunk opening is a bit limited (as expected from a convertible), the capacities it offers – 10 cubic feet with the roof down; 13 cubic feet with the roof up – are decent by class standards, and the overall proportions of the trunk does mean it should swallow up a suitcase or two with relative ease. It’s also worth pointing out that the rear seats fold down completely flat, and the handy toggle switches in the trunk mean you don’t have to clamber around the passenger compartment in order to increase the load bay. Speaking of the rear seats, rear accommodation is also fairly good. 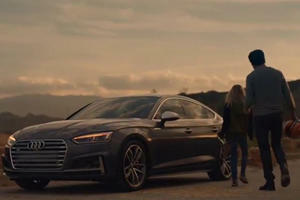 As perhaps expected from a car that shares a lot of its underpinnings with the Buick Regal, there’s enough leg room all round for the driver and the three passengers to feel comfortable in, and the seats themselves are fairly comfortable and supportive. We are, though, not particularly impressed with the compromised rear head room when the fabric roof is in place, and the ease of access that comes through the wide opening doors is countered by the fact the doors take up a lot of space when opening – meaning, in tight parking spots, it’s more effective to climb over the seats and sides of the Cascada instead. The Buick remains resolutely rigid for a vast majority of the time. More boulevard cruiser than back road brawler We’ve mentioned already that the Buick Cascada’s chassis shares a lot with other Buick models. What isn’t as widely known, though, is the fact this cabriolet has a lot under the skin that’s shared with sportier Opel and Vauxhall models. However, don’t go expecting the Buick Cascada to be this riveting cabriolet to thrash on a twisty section of road in light of this revelation. Though the Buick Cascada isn’t bad to drive, it’s also some way short of the standards set by the BMW 2 Series Convertible. Body lean and steering response are fine, but there’s nothing particularly exemplary about them either. They get the job done well – and that’s probably all the Buick Cascada needed to do in this area. Instead, the extra sporty chassis setups are in place to stiffen up the structure, in order to compensate for the fact there’s no solid roof to sustain torsional rigidity. And, by and large, it seems to work on the Buick Cascada. Admittedly, there is a little bit of flex if you’re really keeping an eye out for these things, but the Buick remains resolutely rigid for a vast majority of the time. For sure, the Audi A3 Cabriolet is a bit more planted over rougher road surfaces and sharper imperfections like expansion joints on highways, but the Buick Cascada’s still competent enough in this area. You can raise or lower the roof at speeds of up of 31mph – though, admittedly, it does take 17 seconds to fully retract or bring up. Where we’re really satisfied with the Buick, though, is in regards to its refinement levels. With the roof down, there isn’t much wind roar from the turbulent air that swoops over the top of the windshield, and the triple-layered ‘acoustic’ fabric roof does an exceptional job at suppressing wind roar when it’s raised into place. Plus, you can raise or lower it at speeds of up of 31mph – though, admittedly, it does take 17 seconds to fully retract or bring up. Before this section is wrapped up, it’s worth us pointing out that rear visibility is severely restricted when the roof is raised. The rear window is absolutely tiny, and there are considerable blind spots in the over-the-shoulder view. Granted, these are negated somewhat by the standard-fit reversing camera and rear parking sensors, but be prepared to pay considerable attention to your wingmirrors when you’re out on the open road. Indecisive buyers, rejoice! The Buick Cascada only has on engine/transmission combo! As the above sub-heading states, the Buick Cascada only comes with one engine: in this case, a turbcharged 1.6-liter four-cylinder gasoline engine that’s paired with a six-speed automatic transmission. Since it’s the solitary option available, you’d think the turbo-four would suit the Cascada well – and yet, we do have a couple of issues with it. For starters, we feel it could do with a bit more power. For sure, 200-hp and 217 lb-ft of torque are ample enough (the Audi A3 Cabriolet, for instance only has 182-hp to play with), but that grunt is muted somewhat by the Buick Cacada’s nigh-on-4,000-lbs kerb weight – for reference, the Audi is nearly 800 lbs lighter. As a result, the Buick Cascada does take a while to build up speed (we can’t find any official Buick specs, but the equivalent Vauxhall Cascada in the UK can reach 60mph from rest in just over eight seconds), though the engine’s turbocharged characteristics does mean it’s more accustomed to lower rev range activities, so it’s fine after you’ve got the Cascada up to the speed you want. With claims of 27mpg being attainable on the highway, the Cascada isn’t exactly fuel efficient by the standards of this class. It also helps that the acceleration isn’t hampered by the transmission. Admittedly, the six-speed automatic in the Buick isn’t as smooth or as quick to change gears as the options available in rivals, but the gearshifts themselves are still smooth enough. If we’re being picky, we may have hoped an extra gear or two were available to keep the engine at the optimum power and torque band, but the six-speed isn’t an intrusive transmission that spoils the overall experience. That said, having a higher gear may have helped the Buick Cascada’s fuel consumption figures. With claims of 27mpg being attainable on the highway, the Cascada isn’t exactly fuel efficient by the standards of this class (the BMW 2 Series Convertible, for example, can return 34mpg on the highway). The 20mpg claims for city driving also isn’t particularly spectactular. There is one area where the Buick convertible genuinely pulls the rug from underneath its Audi and BMW rivals. Over the course of this review, we have perhaps unfavourably compared the Buick Cascada to its premium alternatives (primarily because they’re the closest competition this car currently has). However, there is one area where the Buick convertible genuinely pulls the rug from underneath its Audi and BMW rivals: value for money. With a starting price of $33,990, the Buick Cascada is noticeably cheaper than the $37,600 Audi A3 Cabriolet and the $38,950 BMW 2 Series Convertible, with the top-spec Buick Cascada ‘Premium’ trim retailing for $36,990. The Buick Cascada comes with a selection of warranties namely a 6-years/70,000-miles one for the engine, and a 4-years/50,000-miles one for the rest of the car. Even more intriguingly, the Buick Cascada is well equipped for this class. Heating controls for the steering wheel and seats, a reversing camera with rear parking sensors, dual-zone climate control and built-in satellite navigation are available on base Cascadas, with the sole trim option adding goodies like lane departure warning, front parking sensors and automatic windshield wipers to the mix. Considering not even base spec rivals come with all the features the Buick Cascada does (you’ll need to spend close to $40,000 on spec an Audi A3 Cabriolet almost identically to an entry level Cascada), it’s impressive to see the pricing work out rather well for the Buick – and, as a result, make the Premium model that bit easier to recommend if you were primarily looking at more high-end alternatives. Reliability concerns shouldn’t be that big of a deal, considering the Buick Cascada comes with a selection of warranties (namely a 6-years/70,000-miles one for the engine, and a 4-years/50,000-miles one for the rest of the car). Plus, residual values are also expected to be strong, which may – along with the value proposition – convince more people to go with the Buick Cascada over a German equivalent. 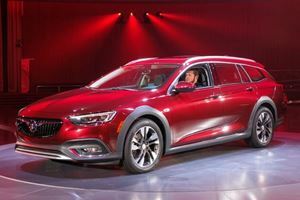 How will the Buick-Opel divorce be decided? Millions were spent on these ads, but not all of them hit the mark. Cam Newton and the Cascada convertible are also there.